Astrology has been advancing and growing for well over the past 2,000 years. It’s quite an amazing feat that the ancient beliefs and ideas it envelops have managed to always stay so relevant, while simultaneously continuing to remain much the same. The timeless practice had sought to link events and occurrences that were happening here on Earth, with celestial and astronomical observations in the sky. It was from these astrological impressions that the 12 zodiac signs were born. According to astrologists, the month and day on which you were born play a significant role in determining all of the personality traits you end up with in life. People tend to focus mainly on the positive qualities of their zodiac sign and those associations are what they’re best known for these days. No one wants to read a negative horoscope and so the favorable stuff is what we remember when we read our astrological forecasts and look into our zodiac profiles. Therefore, in the spirit of knowledge and all things equal and balanced, we give you the most annoying traits associated with each of the zodiac signs. They represent the dark side of your personality and are part of the flaws that make you a bothersome pest! 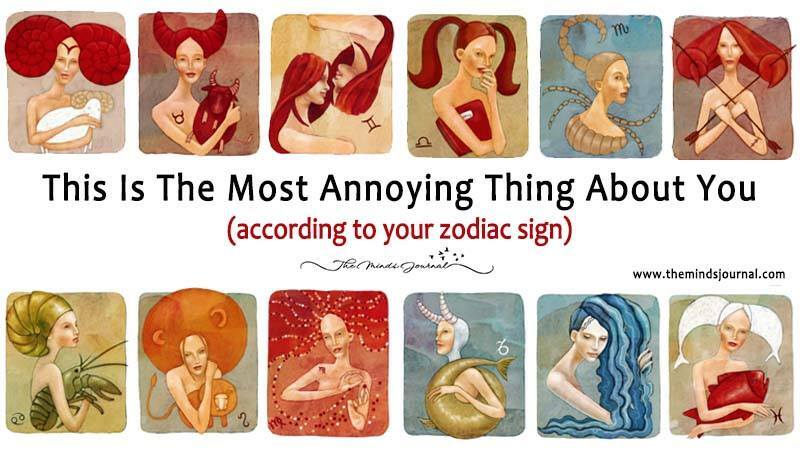 Without further ado, here is a rundown of the most irritating, annoying, and exasperating traits that are predominantly linked to each and every one of the 12 zodiac signs. Find yours below and see if it rings true! Argumentative and mean. Aries like to verbally assault anyone who angers them and will argue anytime, anywhere, anyplace. It doesn’t matter if it’s with family, friends, or complete strangers, they’ll get loud and aggressive in their attempt to control and dominate others around them. Often it can escalate to the point where their behavior is embarrassing and resembles that of a child throwing a hissy fit more than an adult. Lazy and always in the way. Taurus are headstrong people who are at their most annoying when they stubbornly refuse to move. Whether it be moving off the couch or forward in their lives, they will simply stay in one spot and not make any effort or even try. While Taurus may want it all, they don’t want to do anything for it, because they’re stubborn and set in their ways! Gemini are unpredictable, and not in a good way. They are constantly making plans left and right and then canceling them because they’re flighty and always changing their minds. This total lack of self-awareness, and the lack of social grace that accompanies it- which others pick up on, makes them appear childish and deceitful. Make up your mind and stick with it! Sensitive and insecure. You know those people who always need reassurance for everything they ever do, and if they don’t get it they automatically assume you hate them or something bad like that? That’s probably an annoying Cancer you’re dealing with because they’re moody, paranoid, and melancholic. They will mope around feeling bad for themselves and assume everyone is talking bad about them behind their back, when that’s hardly ever the case.